The trail guides us through a key part of the Mt. Elphinstone Prov. Park expansion proposal area. This new protected zone would protect vital resources, such as forest wildlife habitat, wildcrafting and treasured recreational opportunities for future generations. The Health Trail is approx. 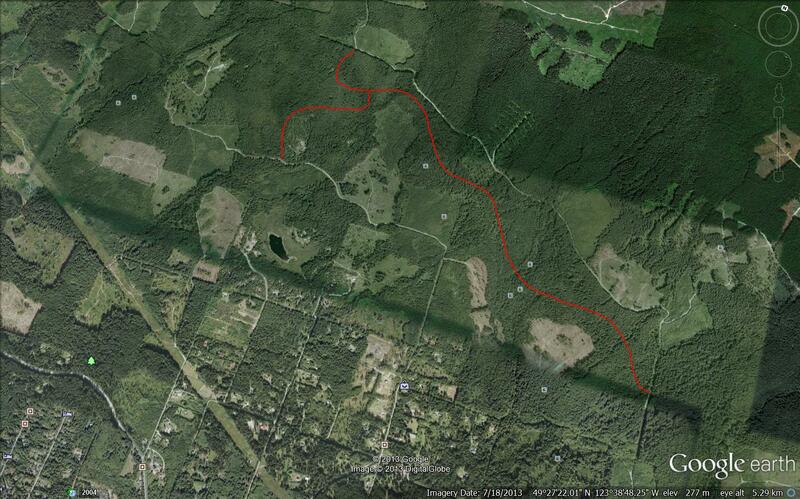 4.4 kms (2.5 miles) in length on varied terrain crossing 10 creeks on narrow foot bridges. This trail has a 7.5 rating for difficulty. Hikers must be in good shape. Estimated round trip: 3.5 hrs. No dogs as cougar, bear, deer, elk, bobcat, pheasants, fox (sighted 12/10/13) and grouse are found throughout the Elphinstone area. Kids 10 yrs and older are encouraged to try it out. The Elphinstone Community Health Trail, from East to West Trail heads, is approx. 4.4 km long. The Trail winds over creeks and emerging old growth forest below the Flume FSR Rd – 8546 branch. It should take a healthy hiker 3 1/2 hours to hike the trail – bring water, snacks, the appropriate footwear and dress accordingly. The trail can be accessed and walked at either of the East, Mid point or West Trail Heads.